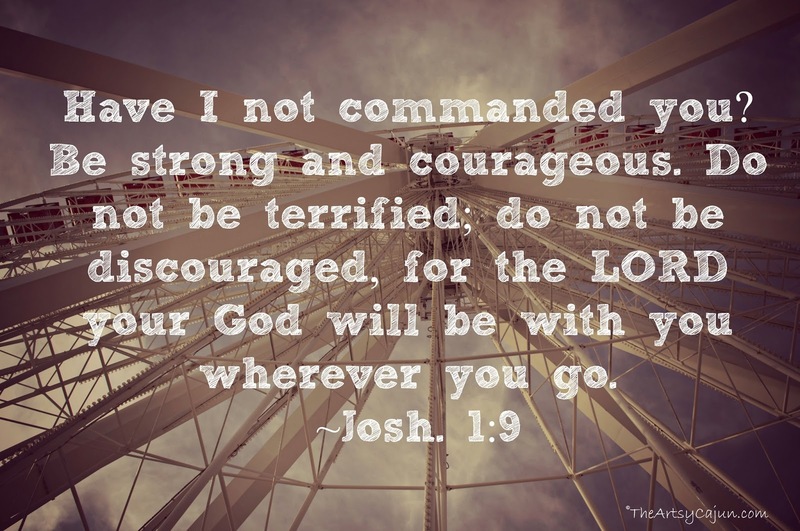 BUT, I couldn't help posting for my Sharing Scripture link up. I totally forgot about it on Thursday, until I was reading Charlene's blog ! Sharing Scripture is the once a month link up to share all of your hand lettering projects, typography and photo shopping skills showing off your favorite scriptures! This link stays open for a month, so come back and link up! I choose this because I love heights! My Mr. does not. And he got on that ferris wheel with me and even if he was nervous or scared, he never showed it. That is love. And it reminded me of this phrase. Often times, we don't do something out of fear. It could be a fear of heights, fear of rejection, fear of embarrassment, or fear of judgement. We censor ourselves from talking about God just in case the other person doesn't believe in Him, or they think we're some sort of bible thumping person who is just going to shout verses at them all day long. And, when I start feeling this way about putting "Too much Christian posts" on my blog, I remember that 1. people come to this blog to read about me- my life and my thoughts. and 2. If they don't like it, they can click out of those posts. It doesn't hurt my feelings at all! We are now accepting co-hosts for Sharing Scripture! Please leave a comment saying you want to co-host below, and I'll send an email over to you about it! EKK! So excited about this! Please check out all the rules, and play nice to follow them. This will be on the first Thursday of every month, for now. The Linkup stays open for a month, so fit your blog post into your own schedule, and then link back here! You are to follow your host, me (for right now, there aren't any co-hosts), on Bloglovin'. You are to link specifically to the blog post about scripture. If you link just to your blog, your link will be deleted. Spread the love! Comment on the person who linked up before you, at least! You can comment on how many ever blogs you'd like, but let's play nice and leave encouragement on the person in front of you. 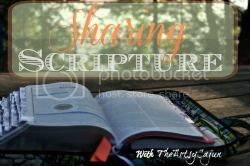 Lastly, but most importantly, put the "Sharing Scripture" link up button somewhere in your blog post so others will learn of this cool little link up and join us! The link up will stay open for 7 days, so plenty of time to link up if you're running a little late! This one is so important, ladies. I want to promote you, but I also want to get the word out about this cool little link up! So, I hate to say it, but your post may be deleted if you're not putting the link up button on your post, somewhere, anywhere, it just needs to be there! Thanks for understanding. Love the verse you chose. I have that one in my arsenal when things become overwhelming. Thanks for sharing! One of my all time favorite verses! Dead scared of heights but I would actually love to visit the Chicago sky deck :) Also, the call to be brave is something I needed to hear. Just last night I was praying to God that I don't want to be afraid of so many things, especially life changes. Thanks for the verse!